There is again a new interesting opportunity in oil. The price is currently at almost 4-year high. You often ask: Will this uptrend continue? Or are we already witnessing turn of the trend? There are several interesting factors that could tell us the direction of further development. Especially one effect is crucial to me. So, let’s look closer at this market today. Technical analysis of oil has not changed for a long time. On the chart, we still see a rising price channel, where the oil price repeatedly tests it´s top and bottom. 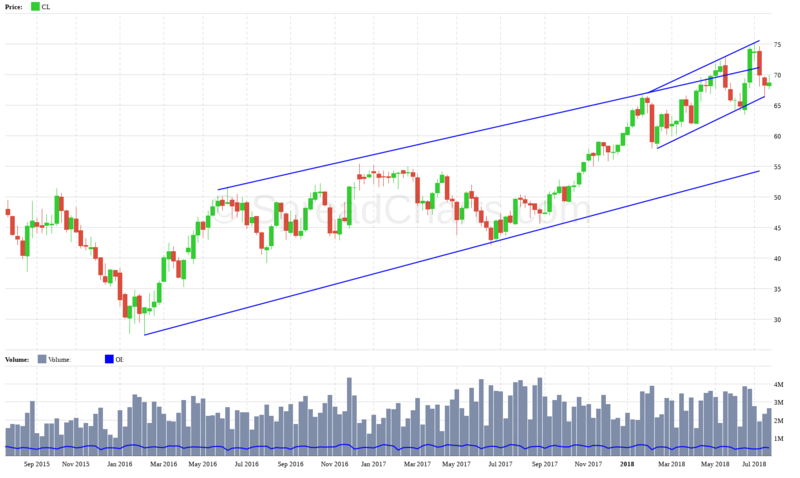 But when we look at the graph properly, we will notice the latest development on the daily chart, where a new pattern – bear flag has emerged. From the name it is clear that this formation is among the patterns indicating the price drop. We can say it represents a pause in the context of a longer fall, which in this case started in July. The bear flag can be clearly seen, for example, on the chart of the contract CLU18 (see the arrow). 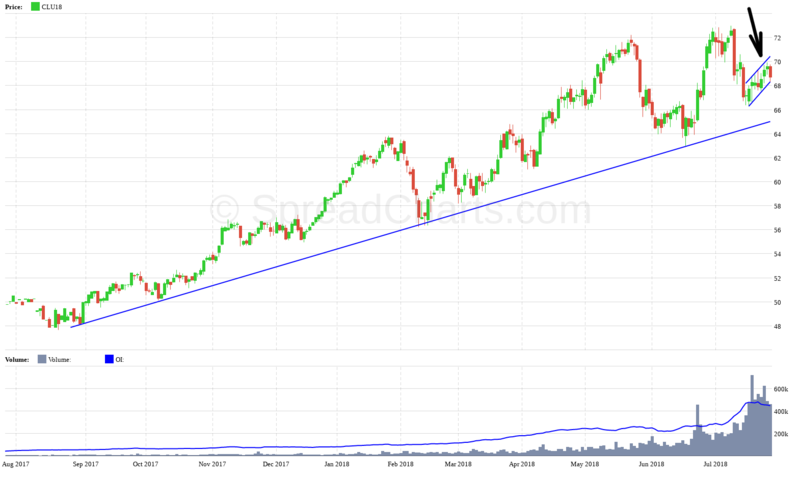 Therefore, the technical analysis suggests at least a continuation of consolidation and possible testing of the lower trendline in the area of ​​around $ 65. The COT position index shows that the group is extremely net long. But that’s not all. The index is at the historic maximum and reaches almost 1. This means that the overwhelming majority of these positions are long. 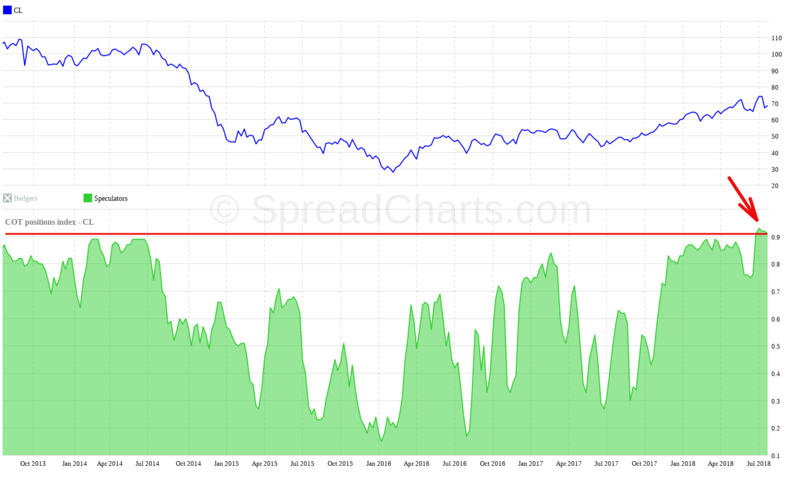 At first glance, you might thing that our analysis of sentiment suggests a rise in oil prices. Indeed, market speculators obviously believe it, so why should oil continue to grow? But the opposite is true. When large speculators (such as large hedge funds or investment banks) are so optimistic and hold huge buying positions, it suggests the trend reversal or at least a correction. Usually, similar situations correspond to local price maximums. Therefore, in the COT analysis we can find a second factor indicating a drop in the oil prices. Let’s move on. What’s happening behind the market? Sometimes the price of a commodity may be a bit “lying” to us. For example, the price is rising, but in fact the market may not be as strong as it seems. That is why I very often compare the price development of the commodity with the development of the market structure. Very simply, we can visualize the market structure on SpreadCharts through term structure, contango development, or development of the spreads. Is it possible that the price of oil is currently lying to us? That’s not so sure. Divergence with the market structure does not have to be 100% correct when it comes to further development. The fact is, however, that the nearest bull spread declines despite the rise in the price of the underlying asset, even under backwardation. This behavior often indicates a weakening market. It is therefore another factor indicating the continuation of consolidation or correction. In addition, when we compare the current term structure to a 5-year average, we find that the backwardation between the first contracts is obviously above average (the blue curve is steeper than the red one). Thus, the market may try to return to a more normal state, which could be accompanied by a drop of the oil prices. This information also shows a potentially interesting opportunity. Weakening backwardation would mean the growth of a given bear spread, in this case the closest bear spread (CLV18-CLU18). You can see this particular spread on the following detailed chart of seasonallity. The spread is trying to grow. For me, however, this opportunity is not interesting from the RRR point of view. The risk is enormous because we are close to expiration. Therefore, the volatility of the spread can be increasing. But I know traders who are looking for such short-term interesting opportunities. Because higher risk also means higher potential profit. 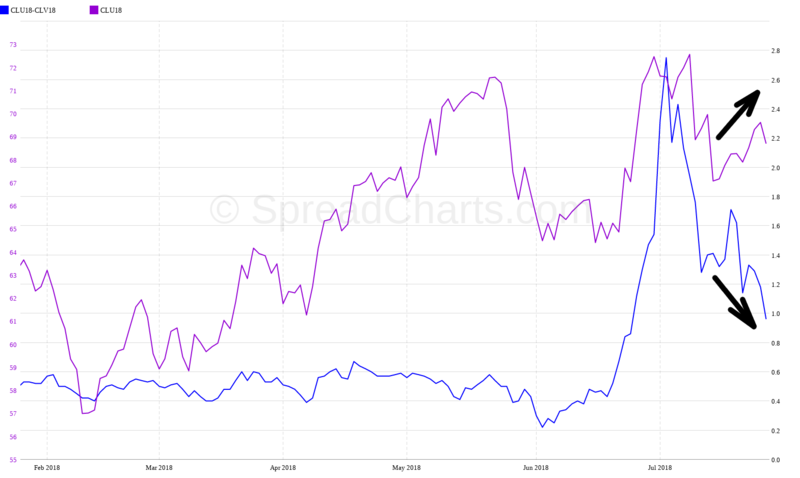 Finally, I am getting to the most important indicator – the intermarket spread between Brent oil and WTI oil. This is a visualization of the WTI oil export pressure to the world. Simply put, the higher the price of the spread, the more is the US WTI oil profitable for export. As you know from my past oil analyzes, it’s the export that pushes the price of US oil up. 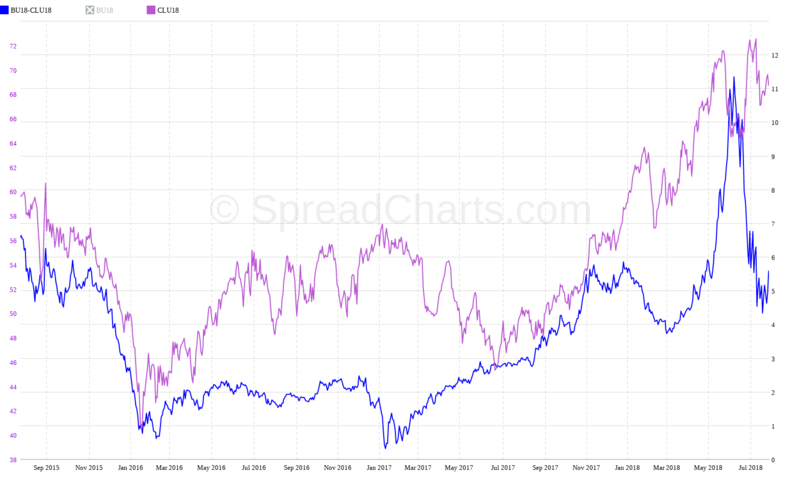 Let´s display now the current intermarket spread BU18-CLU18 and compare its development with the WTI price. I think it is obvious what is behind the rise in oil prices. It is gradually growing export demand. Spread has recently attacked even $ 11. Also note the period when the growth of the spread has stopped, and a turnover appeared. Oil then ceased to grow and went into consolidation. Another breakout of the intermarket spreads over $ 6 – if the oil correction occurs, it will probably be very shallow. The market returns very quickly to the upturn. What scenario do I expect in a short term? According to current data suggesting a heavily overbought market, I do not exclude a correction of the market testing $ 65. In estimating further development, I am coming out from the three points in the previous paragraph. We decided to take advantage of the current situation and opened a short position through the ETF for oil. 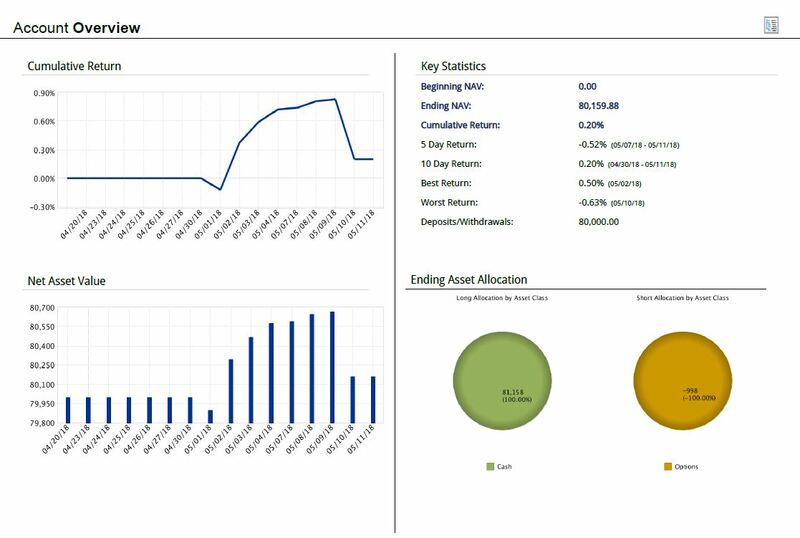 Do not miss a detailed oil analysis in the new Spread Report. This article does not serve as an investment recommendation! All information is intended for study purposes only and in no case serves as an investment recommendation. 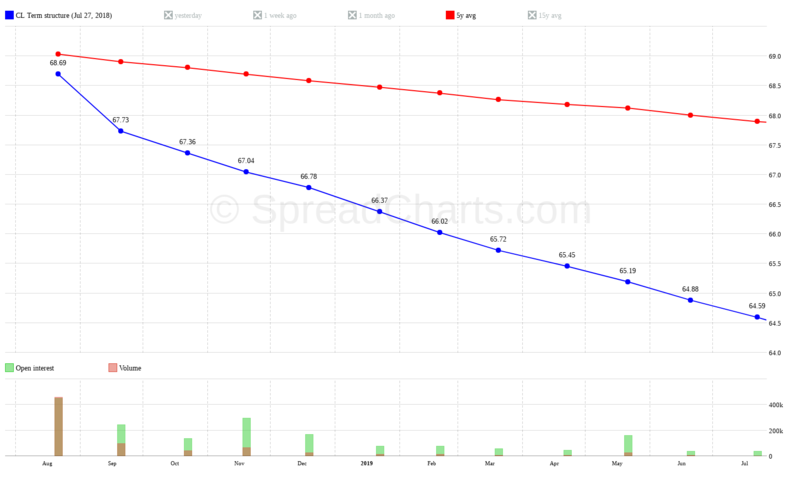 There is a risk of loss in futures trading.